Kyabje Jetsun Lobsang Tenzin Palsangpo was appointed the 104th Ganden Tripa, spiritual leader of the Gelug school of Tibetan Buddhism, in April, 2017. Rinpoche visited the Abbey in 2006, when his title was Gyume Khensur Rinpoche, to teach on the Bodhisattva’s Grounds and Paths. View photos of Rinpoche teaching at the Abbey prior to his role as the Jangtse Choje. Born in Tibet in 1934, Rinpoche was ordained as a monk at the age of seven. Following His Holiness the Dalai Lama into exile in 1959, he entered Sera Je Monastery where he was enrolled into Tsangpa Khangtsen at the age of seventeen. Following a rigorous study of the Buddhist philosophies, he obtained the highest honor of Geshe Lharampa degree in 1979 after debate examinations attended by His Holiness the Dalai Lama and other senior Buddhist scholars. Ater receiving the Geshe Lharampa degree, he entered Gyume Tantric University and two years later became a master of discipline. Rinpoche also studied the esoteric teachings of the Mahayana tradition extensively while he was there at Gyume Tantric University. In 1985, His Holiness the Dalai Lama appointed him as the abbot of Gyume Tantric University, a position he held for 6 years. He was appointed to the position of Jangtse Choje in 2010, which placed him second in line for the position of Gaden Tripa after former Sharpa Chojey late Jetsun Lobsang Tenzin at that time. 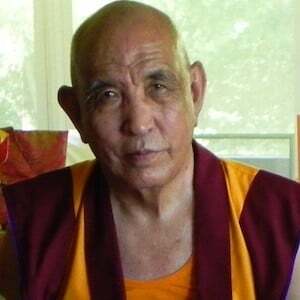 He has taught widely in India and the West, including teaching the summer courses at Deer Park Buddhist Center in Wisconsin, taking over after the retirement of his teacher, Geshe Lhundup Sopa.Rinpoche is also Spiritual Director at Do Ngak Kunphen Ling in Redding. CT.